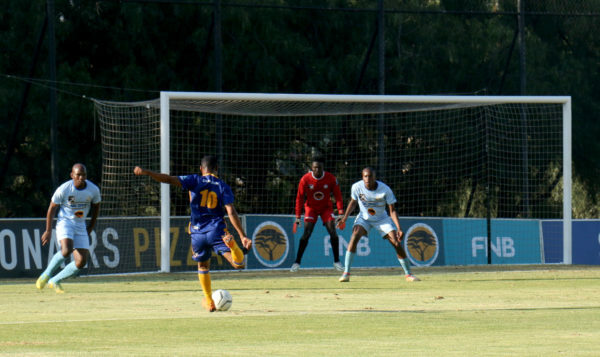 Wits Football’s successful campaign in the Varsity Football season continued on Thursday, August 30, when they beat the University of Limpopo with a score of 2 – 0. The result sees the team from Braamfontein remain in second place with a semi-final spot already secured while the University of Johannesburg remain at the top of the log. The first half of the match was mostly played in the middle of the park with both teams well-organised. Wits created many opportunities but failed to convert in front of the goal for most of the half. The Braamfontein boys finally found a hole in Limpopo’s defence and made it count when Mahle Mtabane scored from close-range for the first goal of the match. In the second half, Wits were awarded a penalty after a Limpopo player handled the ball. The kick was executed with expert precision as Wits increased their lead to two goals. The boys from Braamfontein turned on the style later in the match as they tried to run down the clock and the Polokwane-based boys just weren’t up to the task. The result ended much the same way the match went with Wits holding a comfortable lead. Wits Football coach, Alzavian van Rheede, said it was not the team’s best performance but he was happy to have bagged the victory. Wits will take on TUT on Thursday, September 6, at 18:30. Wits Vuvuzela, Wits football forge ahead in Varsity Football, August 24.